Along with the new features related to the user interface, anti-phishing, Reader and sharing presented in the last Inside OS X 10.8 Mountain Lion segment on Safari, Apple is also adding some new options related to passwords, privacy settings, and Notification Center support for websites. 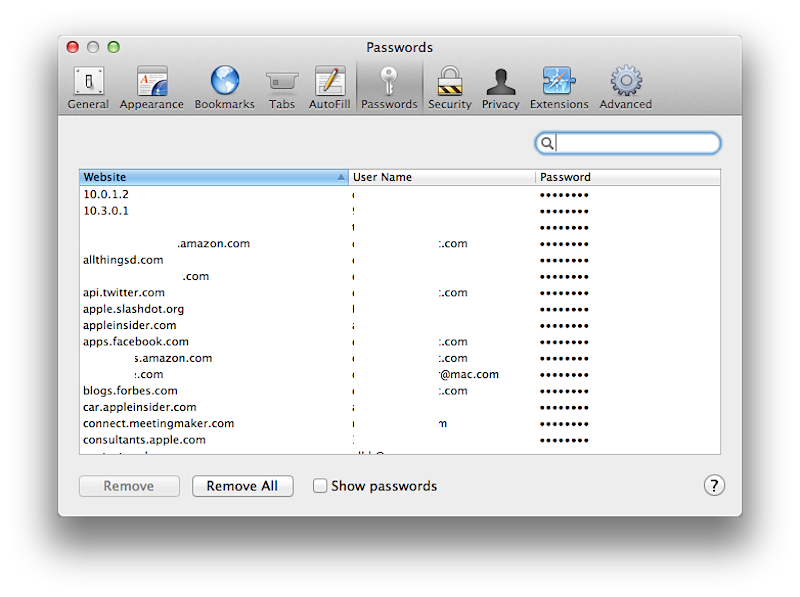 Mountain Lion's Safari adds a new Passwords browser for finding and recovering (or removing) saved passwords you've entered on websites. This works similar to Keychain on a system level. From Safari's Preferences, the Password pane presents a list of the sites you've saved a password, the user names you've entered, and the passwords (revealing them requires entering your system password). This is great if you remember saving a password on a website but can't remember what you entered, but it's a little unnerving that Apple displays all the sites and usernames you have saved without authorizing the display of this information first. Users should be aware that another user on their system could view third potentially sensitive information, but of course, Keychain displays the same kind of username information, just not for individual websites, and some of this information has long been listed in the browser History. Safari's privacy settings have been in the news lately, as reports that Google undermined the default settings to track users with advertising cookies that then enabled it to track users across all the sites it places ads on. 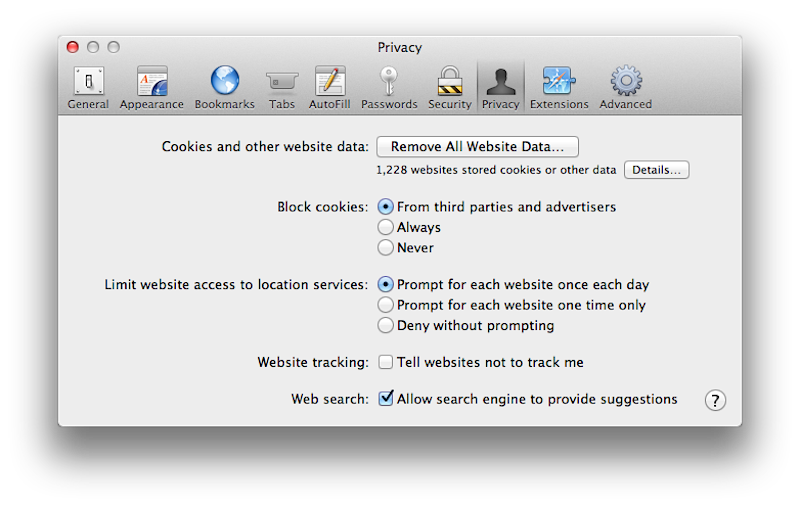 "Block cookies from third parties and advertisers" is still on by default in Safari 5.2, but it adds a website tracking option to "tell websites not to track me," which is not on by default, and also adds "allow search engine to provide suggestions," which is on by default. "Send do not track HTTP header" is already an option hidden within the the current version of Safari under the Develop menu, so it appears Apple is simply making this a mainstream option. Do Not Track is a feature that has been added to all browsers apart from Google's Chrome, and currently only "requests" that web servers not track the user returning it. Wikipedia notes that "websites are not legally required to comply with do not track requests, neither by law nor by broad social consensus, and therefore very few websites recognize and respect this privacy signal." Safari preferences now reference an option that allows websites to deliver alert notifications to the system for publishing in the new Notifications Center. To regulate this behavior, there's now an option to "Limit website alerts and notifications option to to prompt for each website (the default setting) or deny without prompting. A Details button presents a sheet that lists websites that "have asked for permission to post alerts to Notifications Center. 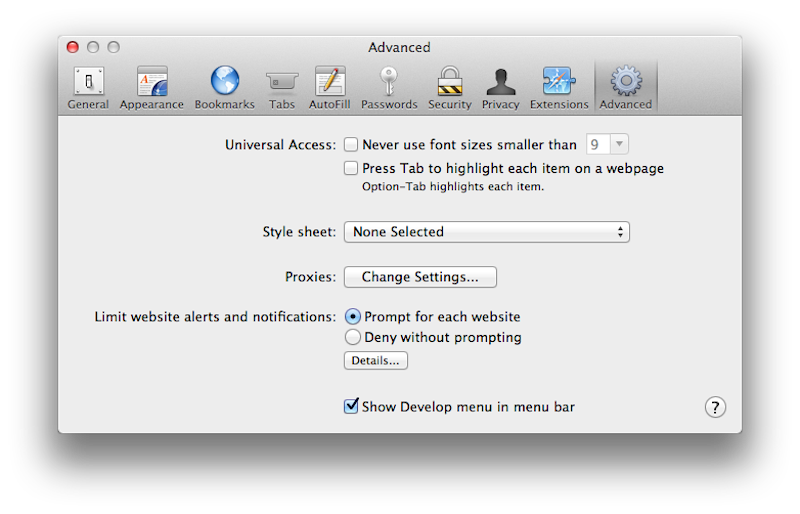 A website that is allowed in Notifications Center can only send you alerts when it is open in Safari" the sheet states. Safari (along with the new Mail) erases RSS as a tacked on feature. The RSS reader features in both Mail and Safari were rather bare bones, making a standalone RSS client more attractive for most users. With RSS removed from Safari, it's not clear whether Apple is just backing out of RSS reader support or if (perhaps more likely) it is gearing up to release a standalone new RSS reader of its own, perhaps tied into Podcasting and other applications of RSS. Other features missing or changed in Safari include the Standard and fixed-width font selections under Appearance (simply no longer there) as well as the Security pane option to "ask before sending a non-secure form from a secure website," which appears to have been made the default behavior. The Advanced pane removes an option for database storage size selection (for HTML5's "super cookies"), and the menu bar option is now missing the option to "Block popup windows," another behavior that may have been made default.